Jaffna People have spoken. Ruling United People Freedom Alliance led by Sri Lanka President Mahinda Rajapaksa has won handsomely in the Jaffna Municipal Council election. Out of the 23 seats in the Jaffna Municipality, UPFA won 13 seats, while Ilankai Tamil Arasu Kadchchi (ITAK) also known as Tamil National Alliance (TNA) won 8 seats, and Independent Group 1 and the Tamil United Liberation Front (TULF) led by V. Anandasangaree won one seat each. A Government spokesman said that all credits must go to Minister Douglas Devananda , who made the victory possible for the ruling UPFA. In the meantime, in the elections for Vavuniya Urban Council, out of the 11 seats, Ilankai Tamil Arasu Kadchchi (ITAK), won 5 seats, while Democratic People’s Liberation Front (PLOTE) 3, UPFA 2 and Sri Lanka Muslim Congress 1 seat. In the both elections, Opposition United National Party (UNP) has been completely routed. As the disciplinary control of the Police is under the IGP once again in the absence of the National Police Commission, authorities are watching to see what action Jayantha Wickramaratna will take against those responsible for the abduction and assault of a 22-year-old information technology student on Tuesday. According to available evidence Nipuna Ramanayaka studying at the Sri Lanka Institute of Information Technology was abducted as he was leaving the institution after sitting an examination on Tuesday afternoon by a group who came in the vehicle bearing registration GC-0343 belonging to the Police department. The youth was later released by the Colombo Crimes Division office at Dematagoda (Vas Gunawardena) after being severely assaulted allegedly in a private house of a senior Police officer, stating it was a case of mistaken identity. IGP Jayantha Wickramaratna contacted in this regard said he would take the necessary action according to the law of the land once he gets the official probe report into the case. Police spokesman Senior Superintendent Ranjith Gunasekera asked about the IGP’s handpicked team probing into the case, said he was not aware of the details or when it would hand in its report. Meanwhile Nipuna continues to receive treatment at the Colombo National Hospital. 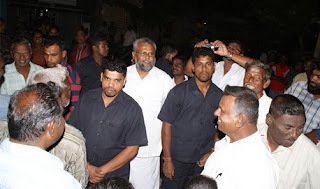 The News-Lanka reliably learns that Nipuna has also been examined by the Judicial Medical Officer for possible institution of legal action against those responsible for the shameful assault. Director of the National Hospital, Dr Hector Weerasinghe said the victim is being treated by surgeons, but he does not appear to require any surgery and that he had not suffered any permanent damage. Menik Farm camps which house over 250, 000 Internally Displaced Persons (IDPs) will soon be confronted with a massive crisis, as humanitarian agencies are allegedly running out of funds allocated for food supply, a local NGO source in Vavuniya said. Zone 3, where those who crossed over to the government controlled areas in the early stages of the conflict are kept, will be the first centre to be affected due to the scarcity of food, according to the source. “NGOs are mandated to provide IDPs with food only for a particular period of time. Some donors have already stopped passing funds. So, although IDPs in Zone 3 are provided with dry rations, they no longer provide complimentary items,” the source said. Other zones will also soon be confronted with the same issue unless redemptive measures are taken, he said. He confided that donors were generally reluctant to provide funding for food supplies. “They are more interested in engaging in the resettlement process”. The IGP has alerted police chiefs in Vavuniya about a racket involving smuggling out IDPs from camps by operatives of several Tamil political parties. In a confidential report sent to the DIG, Vavuniya, the IGP has implicated activists of Tamil political parties who laid down arms to join mainstream politics with smuggling civilians for exorbitant fees. The claim has been confirmed by Vavuniya District TNA MP, S Kishor, who told this newspaper that he is aware that around 50,000 IDPs have escaped from welfare camps by paying money to these groups. He also said that President Mahinda Rajapaksa has been informed of the situation. Sources revealed that amounts ranging from Rs.100, 000 to 10, 00000 have been paid to these groups by the Tamil IDPs for smuggling them out from welfare camps. In addition, Tamil political parties enlist these IDPs as new members and bring them out of the welfare camps. DIG in charge of the Northern Province Nimal Lewke said “We are not still sure about the exact number of IDPs who escaped from the camps. Arrangements are being made to carry out a census on IDPs to check the figures”. The DIG said that the lists of those who have passed away in camps and those who were released must be compared with documents at the Divisional Secretariat and then the number of those who have escaped can be identified”.